Overview - Summer, 2006. A 5th grader Ryuhei discovers a notebook entitled “Tokyo Exploring Records.” It was a journal kept by his father, Shohei, when he was around Ryuhei's age. Ryuhei forms his own exploration party with his friends Shun and Yoshio. One summer day, the party and Ryuhei's younger brother Sasuke who happens to tag along, heads to the dungeon looking for a treasure indicated on the father's map. Soon they encounter some weird but good-natured grown-ups who live underground. The kids are welcomed by the underground residents; but then the dungeon turns into a combat zone involving an old, self-claimed Japanese soldier… Would the kids be able to discover the real treasure hidden underground? Even as a rabid anime fan, I have to admit that I was initially wary of a 40 minute film with a bizarre title like 'SOS! Tokyo Metro Explorers: The Next.' From the plot summary on the back cover, I expected a typically trite fantasy in which a group of children stumble across whatever magical kingdom, mythical world, or incredible creatures the filmmakers could toss on the screen. The confusing title alone was enough to stir up some serious doubt. The only thing that really gave me pause was the involvement of legendary writer/director Katsuhiro Otomo ('Akira,' 'Steamboy'). Loosely based on a short manga by Otomo himself, this pseudo-sequel follows the misadventures of a ragtag band of young explorers in the sewers of Tokyo. As the story goes, a fifth grader named Ryuhei Ozaki (voiced by Sanae Kobayashi) finds a journal his father wrote as a boy called "Tokyo Exploring Records." Inspired by his father's early treasure hunts beneath the city, Ryuhei forms his own exploration team with his friends Shun (Sayaka Aida) and Yoshio (Kikumi Umeda), who find themselves unexpectedly joined by Ryuhei's young, tagalong brother Sasuke (Akiko Yajima) and a mysterious girl named Momoyo (Yuu Asakawa). As the reluctantly-formed crew encounters a colony of homeless people and social outcasts, they meet an old Japanese soldier from WWII who guards the fabled "Treasure of Japan." I may have been skeptical going into 'Tokyo Metro Explorers,' but now that I’ve seen it, I can't stop recommending it. Atypical in its approach, the film tells a startlingly grounded story about normal kids encountering a group of out-of-touch adults who have a difficult time coping with their individual circumstances. The thing director Shinji Takagi nails is the kids' wide-eyed fascination with the underground world they find while searching for treasure. Like any kids, the five explorers perceive their adventure as being more epic than it actually is, as they approach each situation and each underground outcast with the wonderment of discovery and the limited comprehension of youth. The adventure itself is both heartwarming and exciting. A smartly-paced script by writer Sadayuki Murai ('Steamboy') captures the pessimistic overtones of Otomo's work and infuses them with solid dialogue, amusing characters, and low-key chase scenes that keep the story moving along. By the time 'Tokyo Metro Explorers' reaches its action-packed climax, the animated main characters have thoroughly evolved into genuine kids. Their believable reactions to the exaggerated behavior of the film's adults make the entire experience a quiet thrill to watch. And while I always want more from any great anime, the short forty-minute runtime is perfectly suited for an intimate tale of this nature. Rather than relying on the now-standard combination of hand drawn animation and CG, Takagi and his team use 3D animation to create everything in 'Tokyo Metro Explorers.' The new 3D character models look even better than their 2D ancestors -- with an increased framerate, their movement is much smoother and they don't feel disjointed from the environmental elements that are rendered using CG. The benefits are subtle, but they create a fluid experience that doesn't suffer from the visual distractions inherent in other animated 2D/3D hybrids. Technique aside, the most exciting aspect of the animation is how readily it evokes the best of Otomo's character designs and manga artwork. The film's marriage of remarkable technology, gorgeous animation, and masterful design combine to make 'Tokyo Metro Explorers' something truly special. 'SOS! Tokyo Metro Explorers: The Next' may have a difficult title, but don't let that allow you to doubt this one for a second. This quaint and wonderful little tale is an excellent addition to your anime library that shouldn't go overlooked. Unlike other domestic Blu-ray and HD DVD releases from Bandai Visual, 'Tokyo Metro Explorers' comes packaged in a slipcase that matches the standardized size of high definition cases from other studios, and I have to say that it's a relief. I've always been perplexed by the DVD-sized packaging of their previous Blu-ray and HD DVD releases. Also included is a nice 12-page booklet, which I’ll discuss at greater length in the supplements section below. 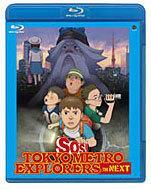 'Tokyo Metro Explorers' features a lovely 1080p/AVC MPEG-4 transfer. To be honest, when I first sat down to watch the film, I expected a garish mish-mash of colors typical of this sort of free-spirited anime. Instead, I found a naturalistic palette that reflects a decidedly real world aesthetic. Despite this more subtle approach, the colors are exceptionally vibrant in high definition, bolstered by stable color fills and comfortable contrast. Even more impressive, darker scenes retain their clarity while masking bolder hues in convincing shadows. Black levels are inky, fine detail reveals the tiniest on screen text, and I failed to find any troublesome source noise or artifacting. The film’s 2D-style animation may ultimately look simplistic compared to a 3D animated flick like 'Ratatouille,' but the technical integrity and faithfulness of Bandai Visual's transfer is just as impressive. In fact, even the most minute background details are so exact that the character models blend perfectly with their surroundings and other CG objects. The only minor hiccup is that the CG character outlines are so consistently crisp that finer edges occasionally reveal a hint of pixelation. While I wouldn’t describe this as a technical deficiency, it may be an annoyance for folks with larger display devices. Regardless, the Blu-ray edition of 'Tokyo Metro Explorers' showcases this intimate adventure with a stunning transfer that sets the bar for every CG anime release to come. Just as impressive as the film's video transfer is its Japanese Dolby TrueHD 5.1 surround track (sorry dubbies, there's no English mix available on this disc). Encoded at 3.0 Mbps, this track seemed a bit cautious to me at first, but it quickly gets down to business over the course of a series of increasingly dynamic encounters. In the film’s quieter moments, acoustics realistically change with the size of each environment, ambiance is ever-present, and the rear channels team with crowd murmurs and accurate echoes. But when a culture clash erupts in a large underground expanse, the soundscape truly comes alive. Bursting flames ripple out from the central channels, swiftly wrapping around to either side and trailing off into the distance. Shouts of panic believably populate each speaker and do a great job of filling the soundscape with a palpable sense of chaos. Better still, gunfire whizzes across the soundfield with smooth, transparent pans that leave little to the imagination. Even so, nothing is more thrilling than the arrival of an antique tank -- its bassy treads brumble heavily along the floor, its high-pitched mechanics squeak and clatter in every direction, and its booming canon takes full advantage of the LFE channel. When the view shifts inside the war machine, the roar of the engine is realistically muffled while dialogue and interior sound effects are given the opportunity to dominate the soundscape. By the end of the film, I found myself simply in awe of an aggressive track that completely caught me off guard. Anime isn't a genre that's often praised for its riveting sound design, but 'Tokyo Metro Explorers' is an entirely different beast that makes the best of its high-def audio package. Anime fans are used to getting short shrift when it comes to special features, but like the standard DVD edition of 'Tokyo Metro Explorers,' this Blu-ray thankfully includes a nice collection of supplements. Filmmakers Commentary -- First up is a detailed commentary track featuring director Shinji Takagi, CGI director Masashi Kokubo, and chief animator Tomonari Nakajima. The three filmmakers have plenty of interesting information to share, but ultimately this is a somewhat subdued track. Still, the only thing that would have made this commentary more thorough would have been the inclusion of Otomo himself. (Note that this track is presented in the original Japanese with English subtitles.). Making Of Featurette (SD, 17 minutes) -- This compelling featurette is divided into eight segments: Opening Interviews (presented with English subtitles), Design, Modeling, Texture, Color, Facial Expression, Animation, and Lighting. The content of each section is pretty self explanatory, but the presentation is a welcome surprise. Test plates, animatics, and final renderings are altered as a pleasant English voiceover describes each step of the animation process. Since the artists worked to replicate the style of 2D animation using CGI, this is a unique technical exploration that held my interest from beginning to end. 12-Page Colored Booklet -- This glossy insert includes information on the history of the project, the process of adapting the manga, character overviews, some interesting notes on scene details, and a print interview with some of the filmmakers. I found 'SOS! Tokyo Metro Explorers: The Next' to be an unexpectedly impressive title all around, featuring wonderful characters and a naturalistic story that never gets boring. This Blu-ray edition from Bandai Visual is excellent as well. An eye-popping transfer and an extraordinary TrueHD audio track make for an anime showcase, while a collection of thorough supplements completes the experience. Unfortunately, the one downside to this release is its high price tag -- it seems Bandai Visual continues to price their own titles out of the market. If not for the cost, this would be an easy buy for anime fans.